Take a moment to breathe in the fresh sea air and relax – you’re at the beach! This six-bedroom oceanfront home is located on one of the best beaches in Newport. 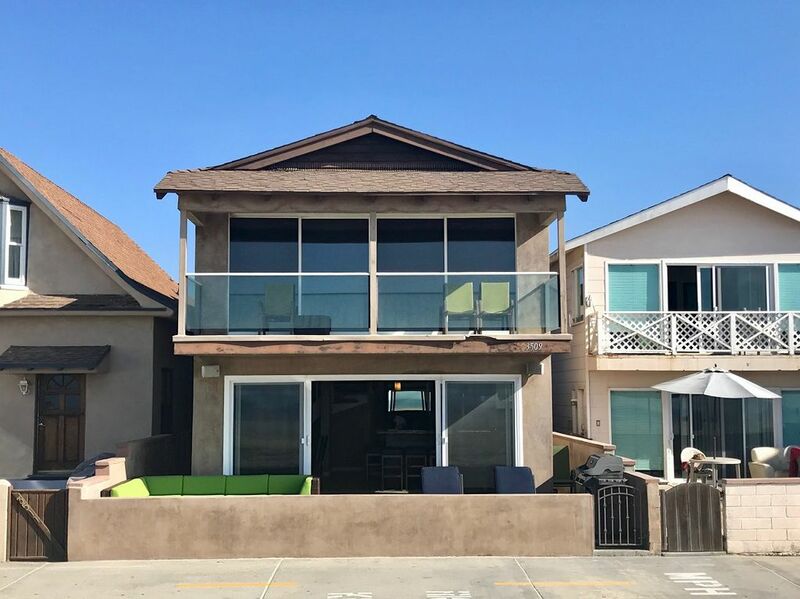 The house has upgraded kitchen & baths, oceanfront master bedroom with balcony and incredible views, and terrific patio on the boardwalk with comfy seating & gas grill. The kitchen has been beautifully redone with granite counters, stainless appliances and an island with sink & stools as well as a breakfast bar with more stools. The high-boy table with six chairs is ideal for meals, sips & dips or gin rummy, Monopoly or Yahtzee tournaments! Best of all, the entire front of this area is glass with full-on beach and ocean views & sound of the surf. Step down from the kitchen into the roomy living area with large sectional couch, coffee table, sleeper sofa & flat screen TV, there’s plenty of room for everyone! The rear of the home has a second kitchen and living room. The back kitchen is ideal for storing extra beverages and food. The home includes six bedrooms, one on the ground floor and five upstairs. The first-floor bedroom has a queen bed and access to the hall bath. The master bedroom with en-suite bath features a walk-in shower and large oceanfront balcony with amazing Catalina & ocean views. Two guest bedrooms on the second floor have queen beds, two have doubles. The hall bath nearest the master is shared by the two queen bedrooms, the rear bath is shared by two rear bedrooms. The house does not have a hallway upstairs, so access to three of the bedrooms is via the front queen bedroom. Guests can go outside and enter through the rear entry door to avoid walking through the front-most bedrooms. The smaller sofa in the downstairs living room folds out into a bed and there is a futon in the upper rear living area. A washer and dryer are located in the laundry room inside from the garage. The home offers exceptional sunset and Catalina Island views and views north to Palos Verdes and south to the Newport Pier. Steps to the sand, the front patio has comfortable couch seating, loungers for sunning, a gas BBQ and umbrella. There are no better memories created than those you’ll make out here, grilling meals and relaxing on the patio or the beach. The garage has two parking spots, the pad behind the garage will hold a third vehicle. The beach at 35th Street is ideal for sunning, swimming, surfing, boogie boarding, body surfing, skim-boarding - pretty much any water or beach related activity you can think of! Jetties at 32nd and 36th St keep the waves manageable for most of the year and shape the waves to make the beach very family-friendly. The boardwalk runs right out front, your pathway to travel the Peninsula by bicycle or on foot. The Newport Pier area is just a short stroll away with shops and local eateries galore. The Dory Fleet Fish Market has been offering “just-caught” fish since 1891, Seaside Donuts has fresh donuts 24/7 )the glazed blueberry are a BW favorite!). 21 Oceanfront & Fly ‘n’ Fish offer more upscale dining. Charlie’s Chili on McFadden Square is “don’t miss” breakfast spot for many visitors & Dory Deli has terrific food morning, noon and night - plus unbeatable people watching! The Peninsula’s only grocery store and dozens of shops and restaurants are all just a short walk away. Las Fajitas for healthy Mexican fare, Hook and Anchor with terrific fresh fish and Gina’s for pizza & pasta for the whole family. The new Lido Marina Village boasts high end shopping & dining. The Lido Theatre, built in 1938, is a unique venue for movie goers. Stay awhile, there's lots to do! Right on the beach! Great master bedroom with balcony. There is a weird bedroom set up upstairs. You have to walk through one bedroom to get through the other. Perfect for siblings or friends. Beautiful house but we were really too busy doing other things to enjoy it plus it rained every single day. Our stay in Newport Beach was made better by the fact that we could stay on the beach. This house was in a fantastic location for our group. Walking distance to the shopping and action of Balboa area, but far enough removed that we could just relax on the patio as well. The house fit all of us (16) very well and the folks at Burr White were a pleasure to deal with. We would definitely look at booking this house again if we're back in Newport Beach. Excellent service... perfect location. The house is well-worn. The house itself is not the same caliber of the location. Paint chipped, electrical spotty upstairs, the carpet on the stairs should have been changed 5 years ago. Kitchen in great shape. If you're ok with paying a premium price for great location (but a house that is a little rough around the edges), this spot might be perfect for you. Overall we enjoyed our vacation. The location is wonderful. Right on the beach and close to Balboa and Newport Piers. Grocery shopping and Lido Isle are all within walking distance. The house has two kitchens which was great as there was a problem with the downstairs freezer, which BW attempted to have repaired twice. The stove needed a minor repair but was very usable. There is a sofa bed in the dining area which was unusable to even sit in, and that should be replaced. The house could do with a heavy duty cleaning. The downstairs bedroom has no screen so the window could not be opened and it was very hot during our stay. But you know, its Newport Beach and we overlooked the few problems and everyone enjoyed themselves. Burr White was excellent to work with. This was our first time, and first vacation in 12 years. The location was perfect, loved the parking, Bluetooth for patio music, space for everyone, and great maintenance staff. The home will be in better condition after our stay, as we had numerous maintenance issues that their on-call staff had to handle. (Nigel and Gary were great!) I hope the owner takes care of all the problems that were not fixed/resolved, as we would like to rent it again next year.